We offer flat $5.95 shipping on orders less than $99 dollars. Please take note that residents in some states must be charged sales tax. There are a few exceptions to this: packages longer than 60 inches, extra bulky items (cargo boxes, baskets), and orders shipping to Alaska/Hawaii. Yes! ReRack offers free shipping on most orders over $99. Orders with free shipping will ship either UPS or USPS (depending on size and location). Note that some items are excluded from free shipping: packages over 60 inches, cargo boxes, cargo baskets, and other over-sized items. Orders shipped to Hawaii and Alaska do not qualify for free shipping. ReRack only ships to the United States. Due to dealership requirements, we cannot ship rack products outside of the U.S.
We now offer free in-store pickup for customers in the Portland area! When checking out online, you will see an option for in-store pickup. Your order will be ready in within 1-2 business days - and you will receive an email when your order is ready to be picked up. 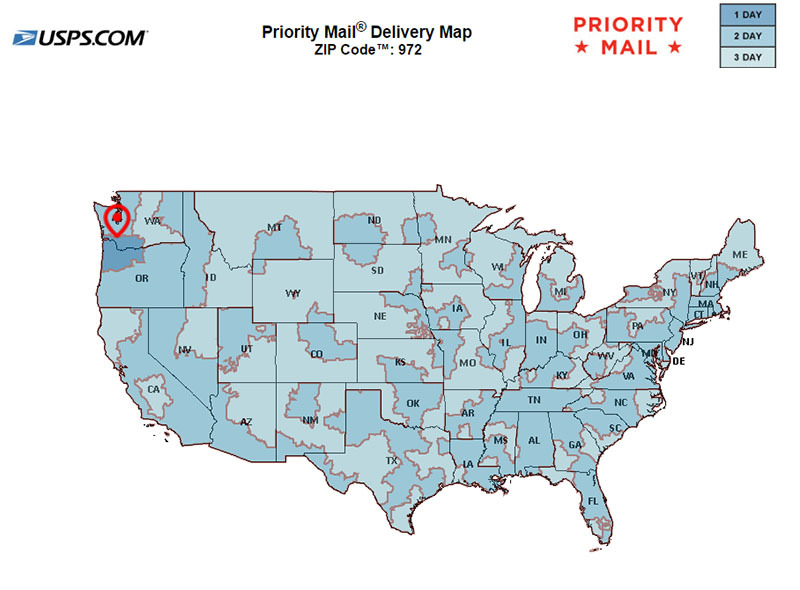 Over 90% of our orders ship within one business day (Mon-Fri.). Transit times will depend on the shipping method chosen, and your location. Please use the maps below to help estimate delivery time. Note that these times are estimates, and not guaranteed by USPS/UPS. All packages refused by the customer or returned as undeliverable by the carrier are subject to the terms and conditions of our return policy plus any additional return shipping costs charged to us by the shipping company. At this time we do not offer overnight or expedited shipping options. Most of our shipments go out same day or next day, however we are limited by our delivery driver's pick up schedule and cannot guarantee delivery times. 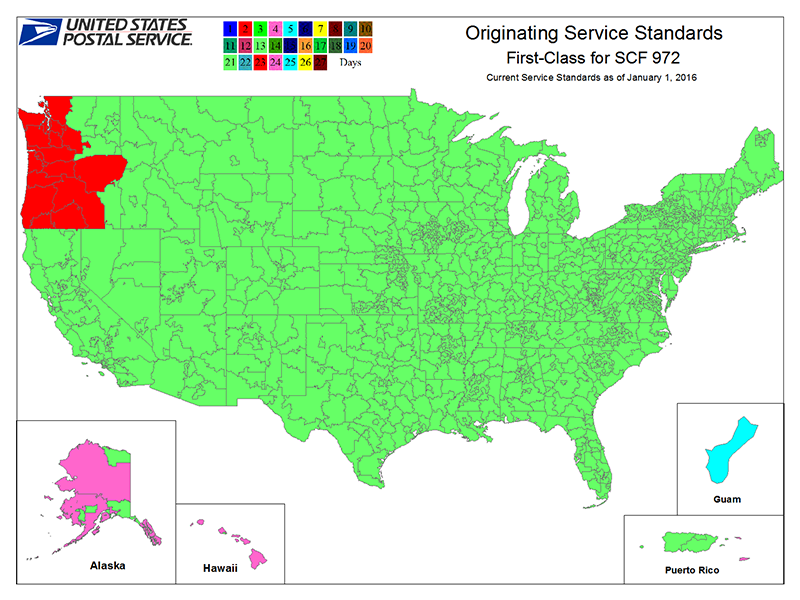 For items that will fit into a USPS Flat Rate mailer, we would be happy to upgrade any first class package for $5. Expect typical delays surrounding holidays. The shipping carrier is responsible for all items in transit; please check tracking status. Some items will ship direct from the Manufacturer. These items may have slightly longer shipping times. Many items are removed from their original packaging and combined to reduce shipping costs. If you would prefer to have the original packaging included with your item, please let us know prior to purchasing so that we can accommodate your request. Note, however, that additional shipping charges may apply. Some of our items have damaged boxes or are missing original boxes all-together. When this happens, we do our best to reuse boxes from other products. This is due in large part to our general company philosophy that directs us toward re-use & re-purposing items. Log in to your customer account on ReRack.com, and view "Completed Orders". Find the order you would like to return, and select the "Return Items" link. From there, you can specify the item(s) you would like to return, and the reason why. Alternatively, if you have not created an account, or do not wish to create an account, you may print our return authorization form and include it in your return. If you have any questions about returns please contact us - include your name, order number, products you wish to return and reason for return. Returns are accepted within 30 days of purchase (shipped date if purchased online). Return shipping costs are the responsibility of the customer, except in cases of damaged/non-functional items. Refunds will be issued to card/payment method used on the initial order. Proof of purchase is required for all refunds or exchanges and the merchandise must be in substantially the same condition as when it was received, and include the original box, packaging, manuals, and accessories. The value of missing and/or damaged items will be deducted from the credit amount for a return and ReRack remains the sole and exclusive judge of the fair value of these items. Shipping and handling costs are not refundable. It is the responsibility of the original purchaser to ensure that returns are adequately packaged, insured, and tracked. Returns placed through Amazon or eBay must be submitted through those channels. Order the wrong part? Interested in something else? As long as your product meets the above criteria, we would love to help get you set up with an exchange! You will need to print out our return/exchange form and include the part/product you are returning, and the part/product you would like to exchange for. Be sure to include your name and contact information so we can ensure there are no remaining balances owed or due back to you. As always, feel free to give us a call with any questions.